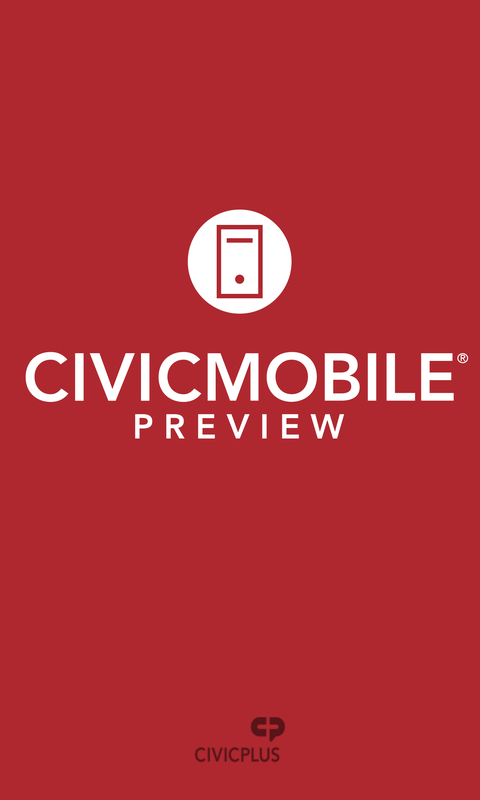 CivicMobile Preview allows users to test CivicMobile applicationsbefore submitting it to the store. Please contact your accountmanager for the access code. GoFerg is the official mobile app for the Cityof Ferguson, MO. The app provides a connection between the City ofFerguson and its citizens and visitors. Users have the ability tosubmit concerns directly from a mobile device, receive emergencyalert notifications, and access a calendar of community events onthe go.Features include:• News - Receive official news about the local area.• Calendar - See what's going on in the city and sign up for eventnotifications and changes.• Emergency Alert - Receive notification about important communitynews, street closures, road conditions and critical emergencies.Also get up-to-the-minute emergency updates.Download the GoFerg app and connect with the City ofFerguson. MyFBTX is the official mobile app for the City of Farmers Branch.The app provides a connection between the City of Farmers Branchand its citizens and visitors. Whether a resident or visitor, thisapp delivers access to community news, events and emergency alerts.Features include: • News – Receive official news about the localarea. • Calendar – See what’s going on in the city and sign up forevent notifications and changes. • Emergency Alert – Receivenotification about important community news, street closures, roadconditions and critical emergencies. Also get up-to-the-minuteemergency updates. Download the MyFBTX app and connect with FarmersBranch TX. Anoka County is the official mobile app for the County of Anoka,MN. Enjoy convenient access to county services, news, events,locations, and more. Features include: • Search – Find the info youneed quickly and easily. • Locations – Get the address anddirections to any county facility. • Calendar – See what’s going onin the county and sign up for event notifications and changes. •News – Receive official news and updates from Anoka Countygovernment. • Sheriff – Quick access news and services from theSheriff’s Office. • Inmate Locator – Quick way to find someone inAnoka County custody. • Report a Concern – Report a problem on acounty road and other issues. • Jobs – View and apply for currentcounty job openings. • Parks – Find a park location or activity. •Bunker Beach – Connect to the county’s water park. • Chomonix –Connect to the county’s golf course. • Go Anoka County – Aninteractive locator map of places to be active. • Property Info –Look up a property by PIN or address. • License Centers – Drivers’license renewal, tabs, and other services. • Recycling – Where totake, what to do with recyclable items. • Highway – Constructionnews on county roads. • Facebook – Like our pages! • Twitter – Keepup to date! • Instagram – Views of the county! • Pinterest – What’sof interest! • FAQs – Common questions and answers about countyservices. • Notify Me – Sign-up for email and text notifications. •Staff Directory – Find phone numbers and email addresses fordepartments and key staff. • My Account – Login to your account onour site. Download our app and connect with Anoka County! GoLansingKS is the official mobile app for the City of Lansing. Theapp provides a connection between the City of Lansing and itscitizens and visitors. Whether a resident or visitor, this appdelivers access to community news, events and emergency alerts.Features include: • News – Receive official news about the localarea. • Calendar – See what’s going on in the city and sign up forevent notifications and changes. • Emergency Alert – Receivenotification about important community news, street closures, roadconditions and critical emergencies. Also get up-to-the-minuteemergency updates. Download the GoLansingKS app and connect withthe City of Lansing. Panama City, FL is the official mobile app for the City of PanamaCity, Florida. The app provides a connection between the PanamaCity and its citizens and visitors. Enjoy convenient access tolocal officials, businesses and event registration. Whether aresident or visitor, this app delivers access to community news,events and emergency alerts and more. Features include: ● News –Receive official news about the local area. ● Calendar – See what’sgoing on in the city and sign up for event notifications andchanges. ● Emergency Alert – Receive notification about importantcommunity news, street closures, road conditions and criticalemergencies. Also get up-to-the-minute emergency updates. Downloadthe Panama City, FL. app and connect with the City of Panama City. Hillsborough CA is the official mobile app for the Town ofHillsborough. The app provides a connection between the Town andits citizens and visitors. Whether a resident or visitor, this appdelivers access to community news, events, departments andemergency alerts. Features include: • News – Receive official newsabout the local area. • Calendar – See what’s going on in the cityand sign up for event notifications and changes. • Emergency Alert– Receive notification about important community news, streetclosures, road conditions and critical emergencies. Also getup-to-the-minute emergency updates. Download the Hillsborough CAmobile app and connect with the Town of Hillsborough. HidalGO FIT is the official mobile app for Hidalgo County Health& Human Services (HCHHS). Whether you are a resident or visitorof Hidalgo County, Texas, the HidalGO FIT mobile app delivers easyaccess to health and wellness information, services provided byHCHHS, public health emergency alerts, and much more. Featuresinclude: 1. HidalGO FIT Wellness Program – Commit to be HidalGOFIT! Learn and practice the HidalGO FIT Healthy Habits for Life. 2.Personal Health Journal – Track your daily nutrition and fitnessactivities with Healthy Cities. 3. Public Health Alerts – Stay upto date with local public health emergencies and latest news.Download the HidalGO FIT mobile app for FREE and connect NOW withHidalgo County Health & Human Services! City of Beachwood is the official mobile app for the City ofBeachwood. The app provides a connection between the City ofBeachwood and its citizens and visitors. Whether a resident orvisitor, this app delivers access to community news, events andemergency alerts. Features include: • News – Receive official newsabout the local area. • Calendar – See what’s going on in the cityand sign up for event notifications and changes. • Emergency Alert– Receive notification about important community news, streetclosures, road conditions and critical emergencies. Also getup-to-the-minute emergency updates. Download the City of Beachwoodapp and connect with the City of Beachwood. Create compelling snapshots of videos in YouTube thumbnail makerfor yt! Just a few steps and you can create perfect custom videothumbnails and miniature. - Photo Collage Select from a dozentemplates for the most suitable one, to begin with. -Fonts KeyboardDozens of fonts, font colors and special font effects available foruse. - Stickers Popular & trending stickers to highlight thebest part of your videos. - Photo Remix Add extra photos andcombine them into photomontages like a PRO. - Graffiti Freestyledoodle drawing with infinite creativity. Disclaimer This is not anofficial YouTube thumbnail maker, the content of which is notaffiliated with, endorsed, sponsored, or specifically approved byYouTube and YouTube is not responsible for it. This powerful ytstudio makes you become a talented creator for thumbnails andminiature. This creator studio can also help you make a logo,intro, flyer, poster, and graphic design. Come and give a try. Group Events is a multi-event mobile app developed to provide easyaccess to information on all group level events.